The challenge will run from January 1, 2016 to December 31, 2016 . Books started prior to January 1st, 2016, are not eligible. To win one of the prizes you must complete the google form and enter in this giveaway at the end of this post (it will start the first of November). You can’t use a book for multiple categories, so one book every category. You can read multiple books for the categories so if you want you can do the 60 Books Reading Challenge, ecc. Books can be any format and any publication date. If you have goodreads you can create a shelf for the challenge. If you have goodreads you should join the group. 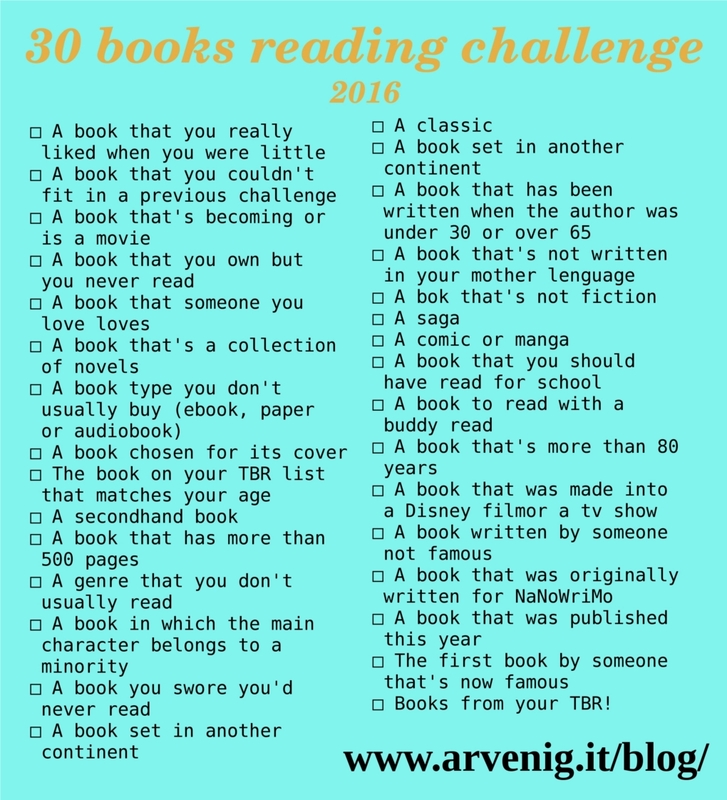 If you have Twitter you can use the hashtag #ArvenigReadingChallenge. Comments under the post are greatly appreciated! With this giveaway you could win one of these prizes: a guest post (6 people can win it) or a printable from QuotesandProse. The prizes will be awarded the first week of January 2017 and if you win the guest post I’ll post them every two months. To win you have to complete the form; after doing that you will be able to click “done” on the giveaway on rafflecopter. If you need some ideas you can easily go to the group where there will be suggestions! In the form you’ll be asked to review the book for every category by writing the name, rating it with the 5 star format and a mini (minimum 2 lines) or long review! I advice you to update the form whenever you finish a book for the challenge since you can change the answers anytime you want! CLICK HERE TO SEE THE FORM AND COMPLETE IT!